Movie: "A Most Violent Year"
Abel Morales (Oscar Isaac) owns a heating fuel business and is on the verge of closing a huge expansion deal for his business. With only 30 days to close the deal, a string of truck hijackings is costing him money. Also, despite trying to run a clean business in a notoriously crooked industry, Abel and his business are under investigation by the District Attorney's office. These issues start to threaten his potential expansion when the bank backs out of the loan. 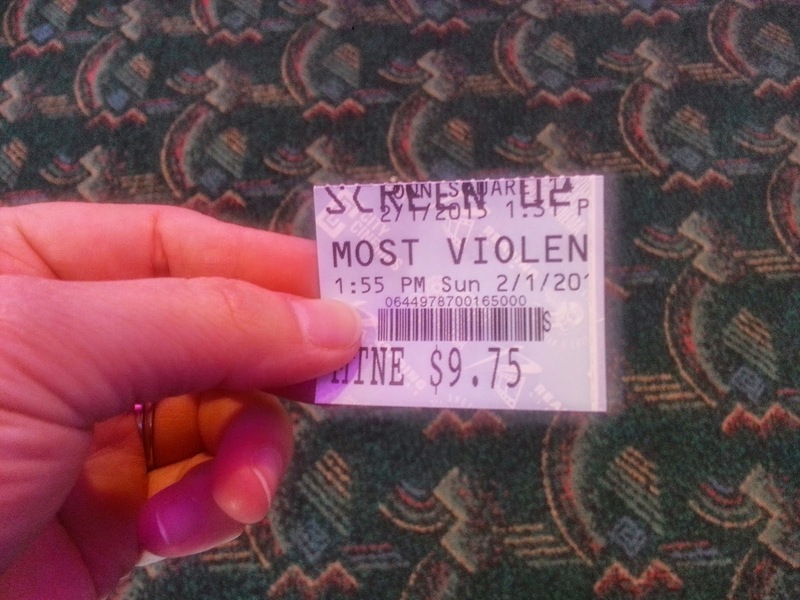 For a movie called "A Most Violent Year," it's not overly violent, well, not until the very end of the movie. This doesn't diminish the film as a whole, though, since it is a slow-burning crawl into the life of Abel Morales, a man who owns an oil supplying business and is trying to grow it clean and legitimately, without the help of his wife's gangster brother and father. Abel tells it like it is, straight and to the point. He is the walking example of the American Dream...or is he? Abel has fought his way, tooth and nail, to the top of the oil supplying food chain, but he is also at a crossroads in his life and with his business, suffering because his work trucks are being hijacked and his employees are being beaten to a pulp on the regular by competitors, though he doesn't know exactly who is carrying out these attacks. Between this and the district attorney's pending charges of tax evasion and corruption charges against him, Abel and everything he has worked for are in jeopardy and he is floundering to keep making his mark. We are glad to see that Oscar Isaac has found at least a little but of success because he is tremendously talented, and he was the perfect choice for Abel. There were times when he was on the screen that we could have sworn we were watching Al Pacino in "The Godfather." Between the hair, the coat, the mannerisms, and the stoic look, Isaac is a doppelganger for Pacino on more than one occasion and it gave me chills. Jessica Chastain has really come into her own as an actress as well, slowly climbing the ranks on our favorite actresses list. She is conniving, sneaky and manipulative behind closed doors, but brash, bold and a little bit scary out in the open. She is fabulous as Anna, Abel's wife and bookkeeper. There is always a sense of trickery and dishonesty looming around her character, but she almost never shows her true intentions, keeping cool until an explosive blowout between the two. Abel is content on staying clean and keeping his work ethic intact, and Anna, coming from a different and more involved gangster background, sometimes quietly and sometimes loudly pushes Abel to see things her way. Their chemistry is excellent and they make for a great dysfunctional team. Apparently Chastain and Issac have been friends since college and have been wanting to do a project together, and well, this was the perfect fit for the two of them. The movie also features David Oyelowo as Lawrence, a cop who has been hassling and pressing Abel for answers about his business. He is excellent, but underused, as is Albert Brooks as Abel's lawyer and friend Andrew Walsh. Filmmakers keep audiences guessing the entire movie until all is revealed towards the end of it. 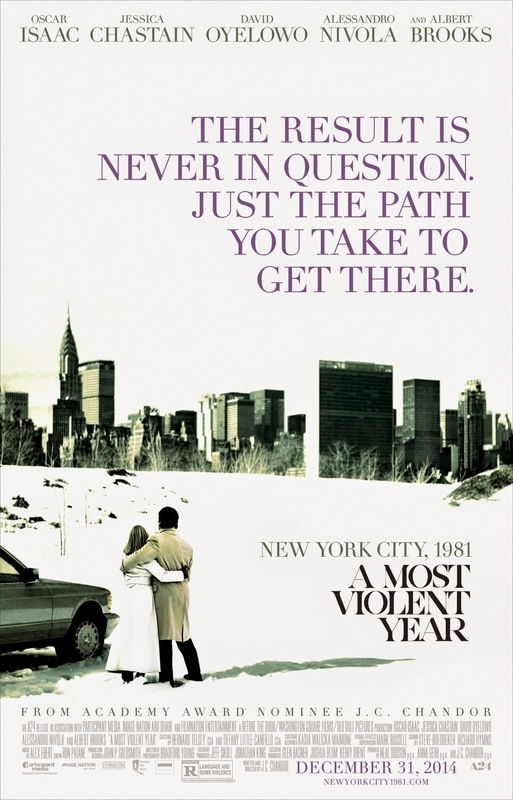 Usually, it might be a complaint of ours to see movie makers not divulging their hand sooner rather than later, but "A Most Violent Year" has enough tension that we didn't notice nor care. Though the pace is a bit slow at times, the film as a whole is a refreshing new take on the gangster genre. It is filled with the typical mobster quotable philosophy, ripe with dreams of making it big and being the best and most successful in any and all business endeavors, but also has much more of an anti-gangster feel as far as violence and drama are concerned. This film has been touted by critics as being "the next great gangster movie," and while this is definitely not the case, it is a decent enough movie that would warrant watching again at some point. There is enough tension, psychology and roughness to make it a better than average movie.